You only have a couple of days so grab those papers with this great offer. 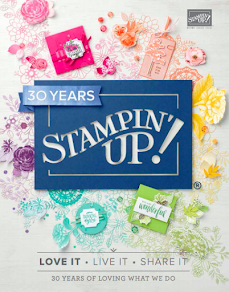 Or why not pop by to my stampin up! website which can be found on the side of my blog and see my upcoming events. Hope you are enjoying your week, it is indeed the middle of the week and almost the weekend yet again. Then have to work 5 days!! Ahh seeing as this week and last week I only worked 4 days. Lucky hey. So here is what inspired. Some great blogs out with sketches and challenges this week, so I took part in a couple even though I just missed taking part in one. This was Freshly Made Sketches where they are celebrating there 100th Sketch. The colour combination came from Colour Q it was very hard not to add some other Christmas Colours. I got the Ornament Keepsakes out seeing as they have carried over from last year's autumn/winter catalogue. I then used my markers to ink up the stamp with island indigo, pacific point & early espresso. I inked the small bauble with the pacific point marker too (as don't have the ink pad yet..as always on my list, but other things seem to be more important), I then quickly searched for my lucky limeade ink pad and stamped the other bauble. Of course ran them through the big shot with the matching framelits. Hope you are all well. I thought I would pop by with another challenge that I came across and want to have a go out. One is a colour challenge and the other is a sketch which I have combined to make my card.